Dubai, UAE, 23 April, 2015 – Nespresso is constantly seeking new and innovative ways to create extraordinary coffee experiences. As a pioneer in the world of coffee, Nespresso looks to other forerunners in the world of fashion and design to collaborate with and to bring the coffee tasting experience to even greater heights. Based on a unique collaboration with the Berlin based industrial design studio GECKELER MICHELS the Touch Collection is a new range of cups that combines breakthrough design with in-cup coffee quality. This design duo are particularly well known for their contemporary mix of different textures and materials. With this new collection, Nespresso offers you the perfect cup to complement your Nespresso system. The Touch Collection will create a truly sensory experience and will complement the Nespresso machine portfolio. Sleek black, straight lines inspired by the fashion trend of sophisticated black are a visual delight; the shiny and matt finish is inspired by the stylish design of the Nespresso machines whilst the shape of the cup with its silicon ring pays homage to the iconic coffee capsule. 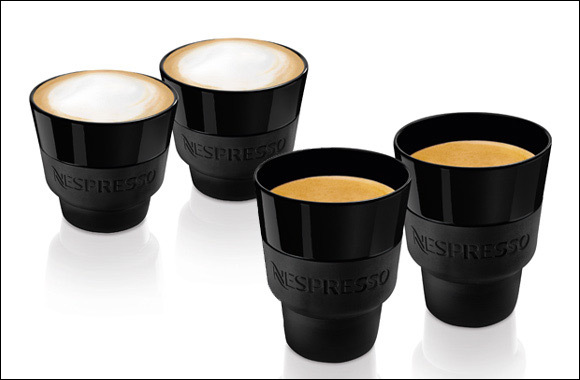 “We tried to integrate the strongest identity element of Nespresso in the cup design, which is the shape of the capsule. This is reflected in the form of the upper part of each cup. The result is a cup shape with a strong silhouette which provides a subconscious hint to the brand’s identity” explained David Geckeler and Frank Michels. The designers chose sophisticated black pigmented porcelain for this collection to guarantee a deep brilliant colour and finish in line with Nespresso’s high quality standards. The soft touch silicon ring with its silky texture was an intuitive solution and inspiration for the name of the collection. This contemporary collection is a must-have for those looking for a stylish way to enjoy their favourite Grands Crus. Nespresso aims to continuously surprise and delight its coffee lovers not only with new discoveries through its Limited Editions but also through its ‘Collections’ to take their coffee experiences to the next level. Discover and enjoy the new Touch Collection from Nespresso at www.nespresso.com or at the Nespresso Boutiques available from April 2015 at a suggested retail price of AED 120 for 2 Espresso Cups, AED 140 for 2 Lungo Cups and AED 150 for 2 Cappuccino Cups.